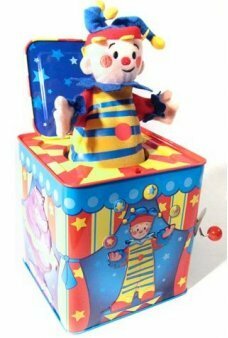 These Circus animals love to perform for you. 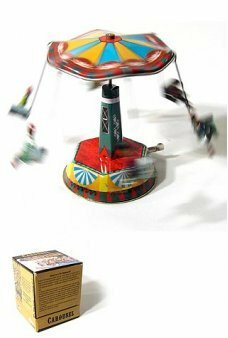 Just wind them up and these tin toy animals show their Big Top show. 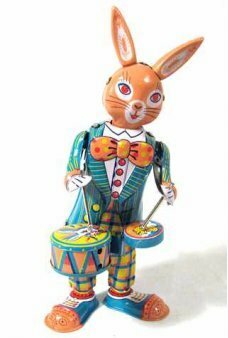 This tin toy is no longer in production (retired). 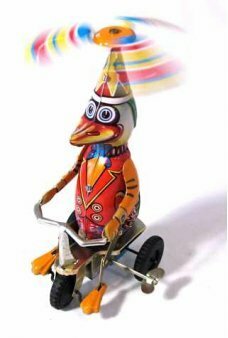 Acrobatic Circus Clown riding a motorcycle. 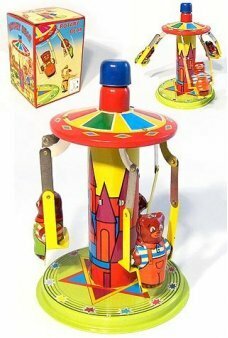 Wind it up, then watch hi..
An elegant German original tin toy! 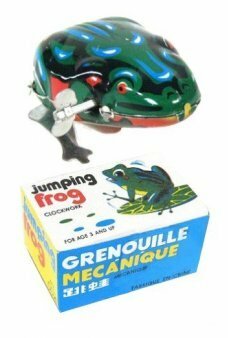 Just wind-up the exposed clockwork mechanism and the four Rocket Cars begin to swing..
A classic wind-up Jumping Frog. The Frog quickly hops on the ground with a wind. He is green with colorful details. He c.. The knight in gold armor rides his horse into battle (or in a parade)? 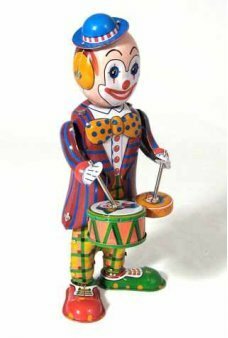 The horse hops ahead on all four shoes or on just..
Our colorful tin toy Drumming Clown wiggles his upper body back and forth while he happliy bangs on his drums. 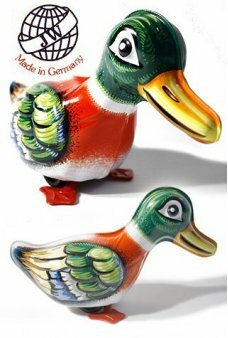 This colo..
A cute mini classic wind-up Paddling Duck with a built-in key. 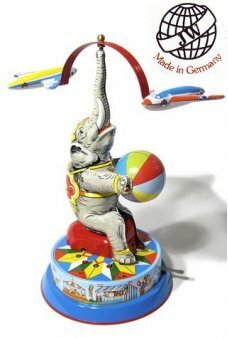 The Paddling Duck swims on land with her duck legs waddli..
Our elephant spins the balanced airplanes on his trunk while holding a colorful ball. 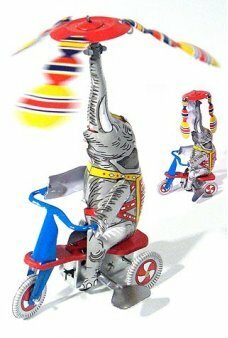 Our beautiful Elephant + Aviators ..
Our beautiful Pracing tin toy horse, performs and hops on her front legs! 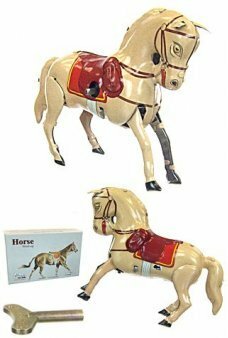 Just wind up our pretty Palomino horse and she..
An elegant interpretation of the famous Tin Toy Rocket Swing Ride! 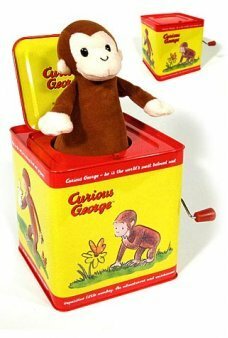 Just wind-up the exposed clockwork mechanism and the .. Cute Kangaroo and Joey bounce ahead with a wind. 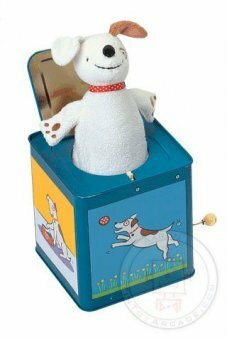 She features a built-in key and rubber, ears, joey and tail. 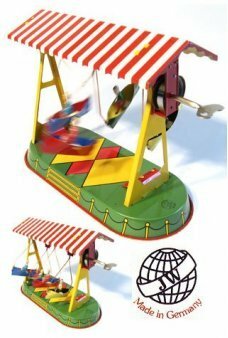 She comes ..
Ride the Space Capsule Carrousel like a real astronaut! 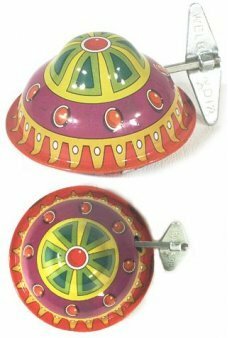 Wind up the base and the 3 capsules spin higher and higher with ..
An elegant German original tin toy! 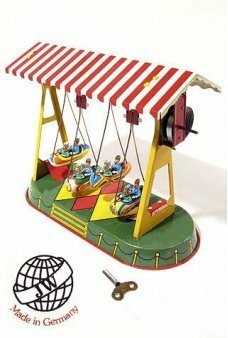 Just wind-up the high-quality exposed clockwork mechanism and the four Canoes begin..
Three cute bears in color overalls enjoy a spinning ride. 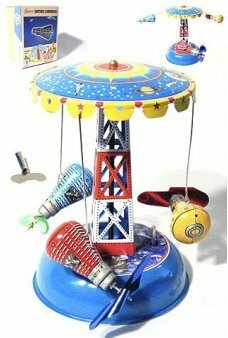 Just stroke the blue top of the tower to see the bears go arou..
As seen in the toy shop in Scorsese’s wonderful 2011 film, Hugo - Jumbo, the elephant spins the tin ornament on his trun..
Our beautiful Pecking Duck is a large classic friction wind-up made by German tin toy craftman, Joseph Wagner (JW). The .. 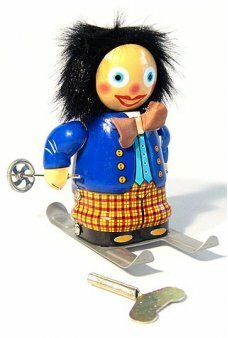 He's a happy skier and his hair is too! 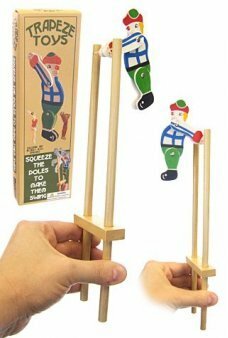 Our Happy Holiday Skier is beautifully designed with a detailed blue and plaid s..
Harley the Monkey really walks on his hands! Just wind up Harley and he wiggles his feet while he quickly steps forwar..